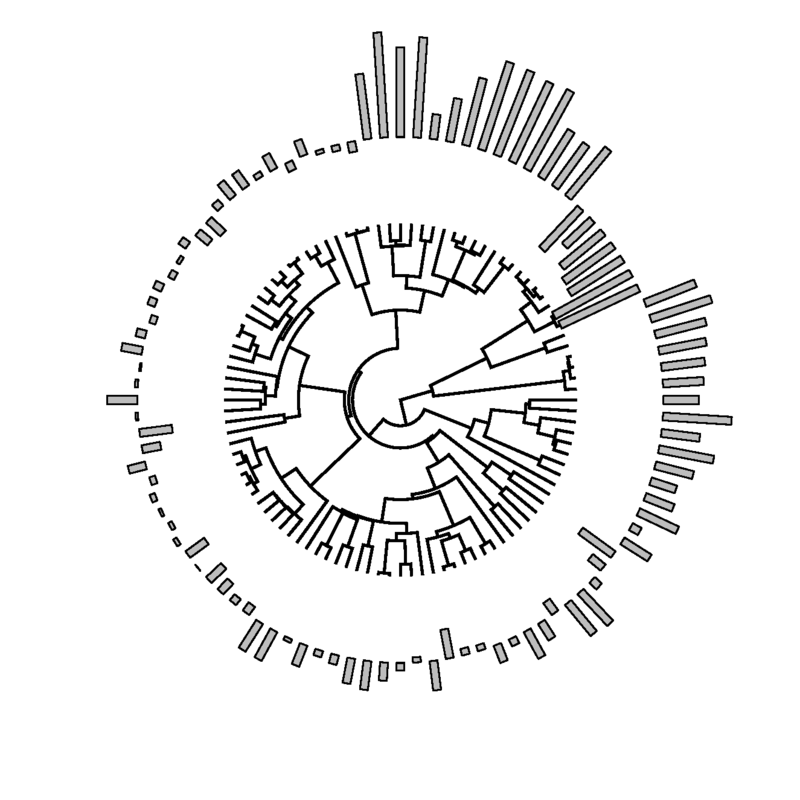 A couple of weeks ago I posted a new function (1, 2) to plot bars at the tips of a circular or square phylogram. One limitation of this function is that because the bars are plotted 'growing' out of each leaf of the tree, the values of the phenotypic trait data underlying the bars cannot be negative. 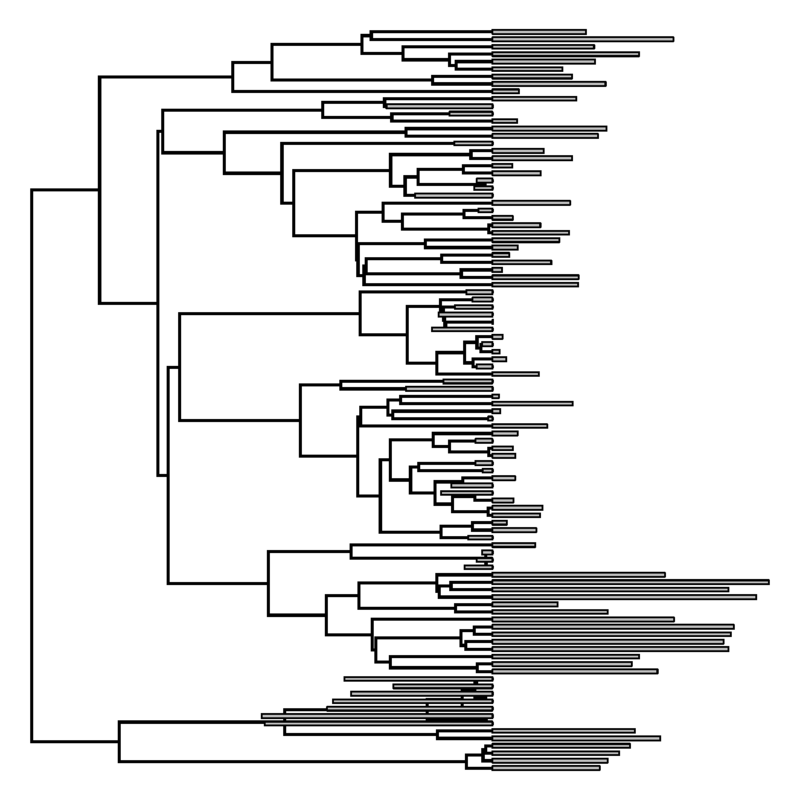 Negative values would result in bars growing (in the case of a fan tree) towards the root of the tree - which, of course, does not look right at all. > ## or setting type="fan"
I'm not sure it makes a great visual in this case - but, nonetheless, it's better. The code for this new function version is here; but you can also install a new build of phytools from source with this update. I figured out how to plot the arcplot with this package (https://github.com/gastonstat/arcdiagram). 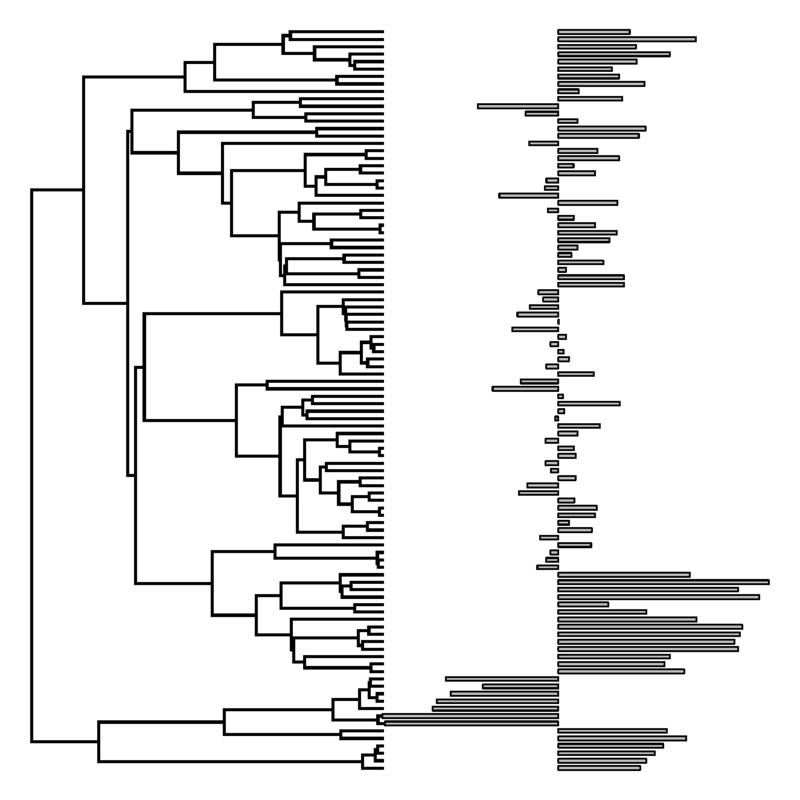 But since I am not familiar with either these two packages (ape and arcdiagram), I do not know how to plot the phylogeny and the arcplot in the same window. I can use `par(mfrow = c(1,2))` but these two plots will not align well. I read the source code of the arcdiagram package and it is not a complex one. But the ape and your phytools are. As a result, I think the fastest way is just comment here and ask for your help. Any idea/interests to put this thought into a function? Error: could not find function "plotTree.wBars"
I am really interested in using this script but I had some issues running the function on my data... 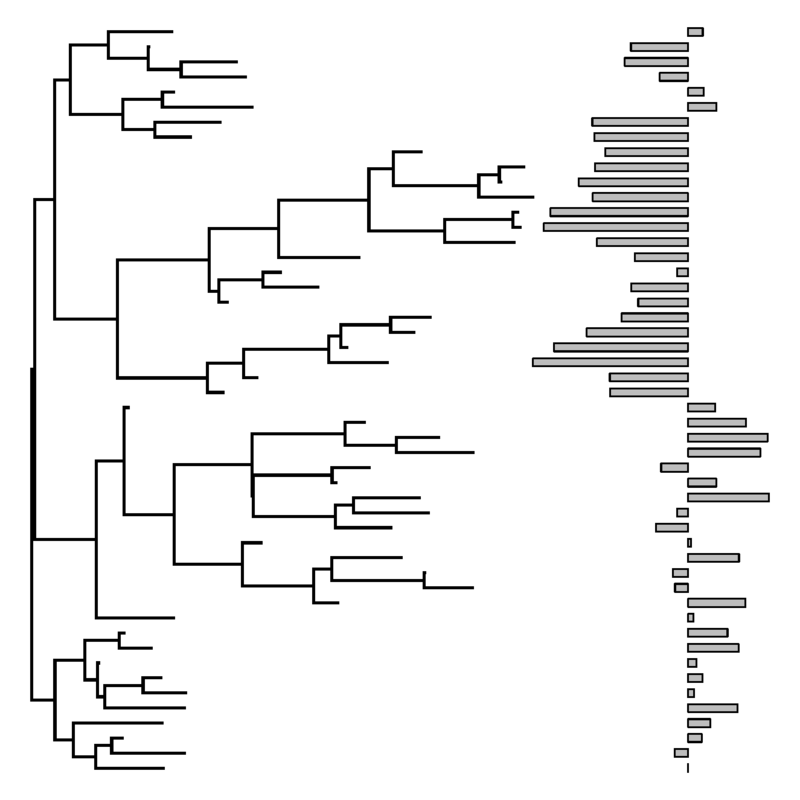 I have a tree, newick format, and one vector of numerical phenotypic data (a text file, tab delimited, 2 columns: names corresponding to the leaves of the tree and the phenotypic values, imported as a table with header=TRUE and row.names=1). Any idea of what went wrong...? I believe that x should be a vector with names, not a table or matrix. It seems to work! thanks!!! I might have a problem of scale though: bars are huge compare to the tree... But thanks for fixing my issue!!!!! Is the problem could come from a different issue...? Not sure. Try saving your R workspace & emailing it to me. I will troubleshoot. Is there a way to color the bars by a categorical trait value? I have only been able to figure out how to color branches by a trait, but not the tip labels or bars. In your first couple example figures, if you wanted to color bars differentially based on State A or B, how would you do that? 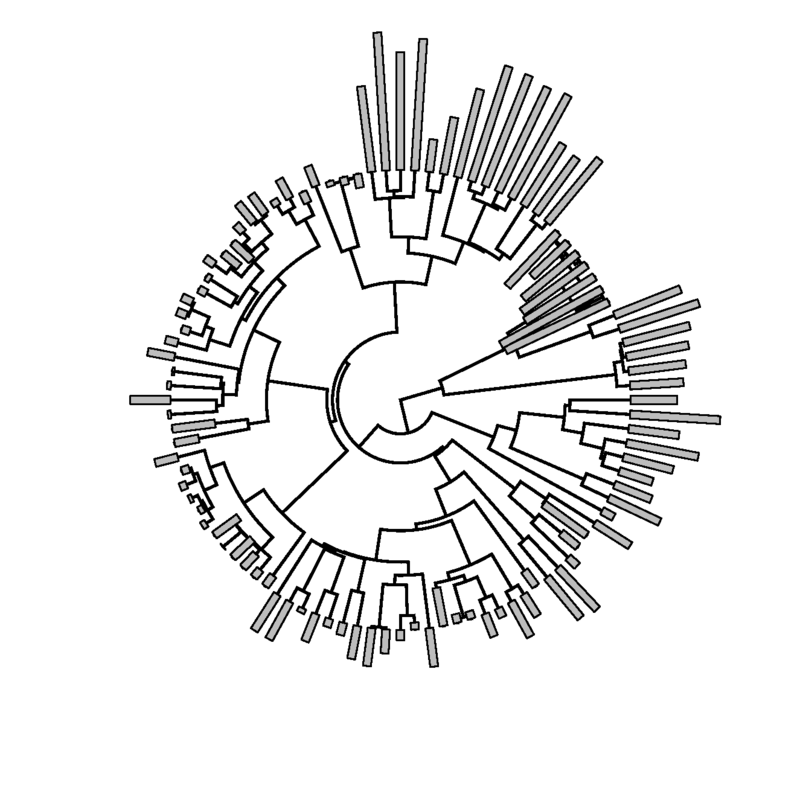 In the function version plotTree.barplot this is possible. Here is an example.